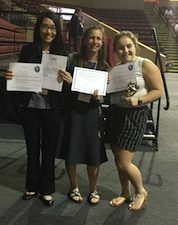 The 2017 Lowcountry Regional Science and Engineering Fair was held Tuesday, April 4, 2017 at the College of Charleston TD Arena. Over 120 students participated showing off their wonderful projects in science, engineering and math. Congratulations to all of our winners, this list of which can be accessed at http://lhsm.cofc.edu/lowcountry-science-fair/index.php. 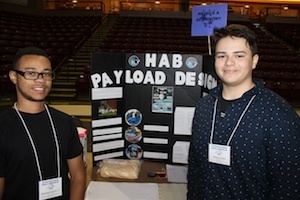 Two Engineering students from Stall High School with their high altitude balloon payload. The top winners this year included: From the Junior 1 Division (5th and 6th grade), Lindsey Fauerbach, from East Cooper Montessori School, took 1st place for her project, Enjoy the Ride about coding an mBot, a robotic car, to prove that self-driving cars are now realistic. From the Junior 2 Division (7th and 8th grade), Benjamin Lipschutz, from Addlestone Hebrew Academy, took first place for his project, Evaluation of the Five Second Rule and Beyond, to test food that is on the floor for less than and more than five seconds to assess if it becomes contaminated. From the Senior 1 Division (9th and 10th grade), Rachel Esienhart, from Palmetto Scholars Academy, took first place for her project, Brain Food: Multisensory Perception and Interference, an experiment to determine whether or not the McGurk effect could be applied to sight and taste. And from the Senior 2 Division (11th and 12th grades), Jenny Yao from academic Magnet High School, took first place for her project, Identifying Limiting Nutrient on Stem Cell Spheroid Viability for Human Cardiac Tissue Regeneration, which looked at Stem cell-derived cardiomyocyte spheroids as potential cell delivery systems that improve cell retention and engraftmen. The overall winner of the Lowcountry Regional Science and Engineering Fair was Jenny Yao, who will travel to Los Angeles, CA to present her project at the Intel International Science and Engineering Fair. In addition, this year, the overall second place winner, Ali DeLambo will also travel there. Amazing Projects!